This frequently asked questions page is to answer any questions you might have about Woody Island Eco Tours. You’ll find information about booking, traveling and much more. DO I NEED TO BOOK & WHEN SHOULD I BOOK? Bookings are essential to guarantee a seat on our boats. Our Woody Island “Island Express” vessel is licensed to carry 26 passengers. Pre-booking ensures that a seat is reserved for you. Bookings should be completed as soon as you can! This will ensure you have the greatest choice available. 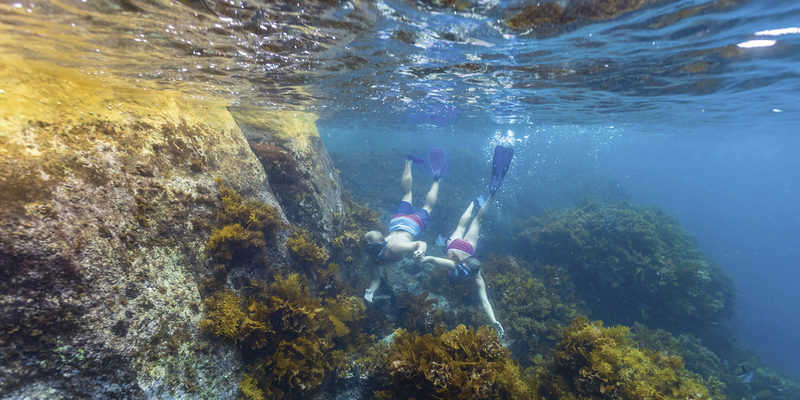 As families love to go to Woody Island, school holidays and public holidays can be very popular and sell out quickly. Keep this in mind, book early and get ready for a wonderful experience. HOW DO I BOOK MY ISLAND EXPERIENCE? Booking couldn’t be easier! Just use our online booking tool right here! When you book online you will be able to securely pay with your credit or debit card. A booking confirmation will then be emailed. Please note a service fee may apply to credit card transactions, subject to change. DO I GET A REFUND IF I CANCEL MY JOURNEY? Cancellations made less than 24 hours prior to departure will receive no refund, otherwise a credit note (with one year validity) will be issued. Please contact us admin@woodyisland.com.au before your scheduled departure time for any cancellations. You are not required to bring your physical “ticket” with you to board the vessel, simply provide the name on your booking and our crew will have the list of the passengers. Gift vouchers MUST be redeemed before attempting to board the vessel. 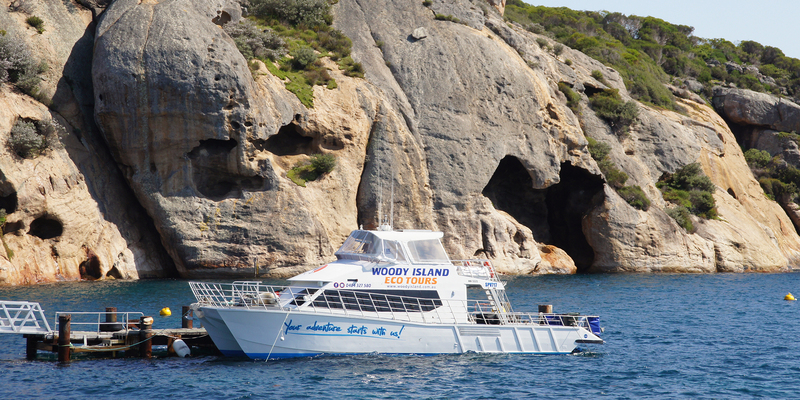 Our staff will not accept any voucher on board; you need to book via our website or admin@woodyisland.com.au, with the voucher’s number and the passenger’s names, prior to departure day. DO YOU HAVE A SPECIAL PRICE FOR CHILDREN OR SENIORS? Yes we do; you can view our travel fares on our Daily Trips page. DOES THE FERRY RUN ALL YEAR ROUND? We run the ferry from November to June every day (except Christmas Day), weather and numbers permitting. However, we can open during the off season for any special events. WHERE DOES THE FERRY DEPART? You can park your car in Taylor Street, or on the Esplanade. WHAT TIME DO I NEED TO BE AT THE FERRY PRIOR TO DEPARTURE? Woody Island Eco Tours asks passengers to be at the ferry 15-20 minutes prior to departure to have enough time to load equipment and passengers. HOW MUCH LUGGAGE CAN I BRING TO WOODY ISLAND? We will accept on board one Esky + snorkeling gear + fishing gear per person (no spear guns will be accepted). We can also accept kayaks, paddle boards and other large equipment – please consult us 24-48h before departure to ensure space. Please also make sure that all luggage and food is stored in zip tight bags or plastic storage containers that are easily carried to avoid damage or goods spilling during transit. Woody Island Eco Tours recommends tagging your bags and Esky. WHAT IF MY LUGGAGE IS DAMAGED IN TRANSIT? All luggage and personal items are transported entirely at the risk of the ticket holder. We will always take the utmost care with your belongings, but as we cannot inspect the condition or the method of packing by the ticket holder, we do not accept any liability for damage to any items. CAN I SMOKE ON THE FERRY & THE ISLAND? Smoking is prohibited on our Ferry Express, as well as in the Visitors Centre, Campers Kitchen, toilets and tent/safari hut accommodations. If you do smoke, please smoke in the designated areas and dispose of your butts in the bins provided. Woody Island has extreme fire danger year round, so please be considerate. The Kiosk is open from 9am – 2pm and sells burgers, fish & chips, toasted sandwiches, drinks, coffee, milkshakes and snacks. The Kiosk can be open for dinner or breakfast with advanced notice. Blackjacks Bar is open from 10am – 10pm daily. We have gluten free bread available, but can not guarantee no cross-contamination in our kitchen. WHAT SHOULD I EXPECT WHEN STAYING OVERNIGHT? Battery operated LED strip lighting is installed in tents/safari huts, but be sure to bring a torch to navigate the paths at night. Closed in shoes are a good idea as the sand can make feet very dirty. If bringing items of value, please store in your tent/safari hut. Doors can be locked on safari huts only. WHAT EQUIPMENT IS IN THE CAMPERS KITCHEN? We provide a shared fridge/freezer, gas burners, BBQ’s, rice cooker, limited pots & pans and basic cutlery. Bring a sharp knife if planning on catching and filleting fish. A selection of books and games are available. IS THERE PHONE COVERAGE & WIFI? Woody Island has excellent phone coverage on the northern side of the island and free wifi access in the Visitors Centre. No power is available in safari huts or tents. 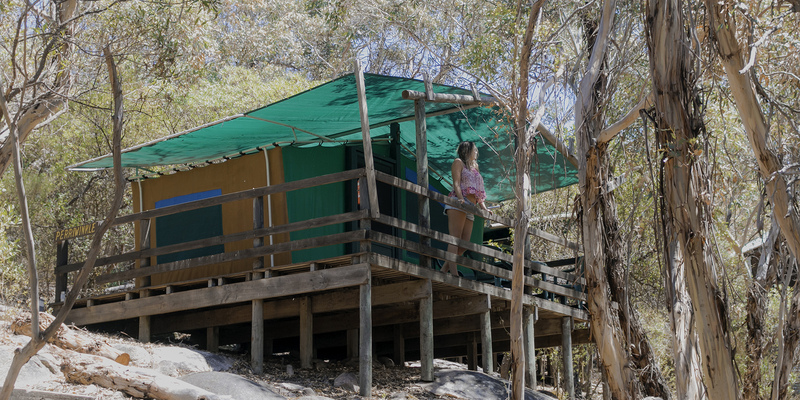 Equipment can be charged in the Campers Kitchen, Campers Ablution Block and Visitors Centre. CAN I ORGANISE AN EVENT & BOOK OUT WOODY ISLAND? We would enjoy working with you on exclusive use of the island and the ferry for your special event. Just contact us at admin@woodyisland.com.au to discuss your vision. STILL CAN’T FIND AN ANSWER? JUST ASK US! 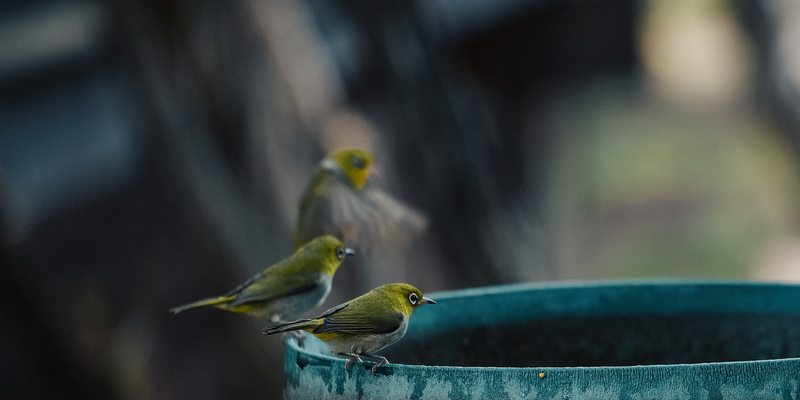 Phone us: +61 (0)484 327 580 or click here to get in touch – it’s that easy!